China’s increasingly tough clampdown on money flowing out of its borders is having far reaching implications not just for its own citizens, but also for property developers across South East Asia, with Forest City in Johor being one prominent project starting to feel the effects. Just few weeks back, two Singapore Condos (Privatised HUDC estate), Rio Casa and Eunosville were sold via collective sales. And now, another two new private HUDC estates are up in the market and determined to sell! The Tampines Court which comprises of 560 residential units is expected to be launched in the early July. On the other hand, there is the Florence Regency in Hougang with 336 units that is already in the initial sales process. Kajima development (SPH) which is linked to the Singaporean Press Holdings has put forward its highest bid ever recorded in a tender. The bid is for a 99 year-old lease that combines both residential and commercial sites in Bidadari. The company came out to a bidding price of a whopping $1.132 billion which translates to about $1,181 for each square foot (per plot). This building can be located at the upper corner of serangoon road. HDB rents rose a notch in May; rental value of condos depreciates further. Last month, the local residential leasing market had mixed fortunes because rents for public housing flats rose a bit higher while the rental value of condominiums continued their fall. According to flash estimates released yesterday, the rental value of private condos lost 0.8% between April and May 2017, and their value decreased by 3.9% since May 2016. Charles & Keith an established brand owner of Singapore for women’s footwear and accessories has made another private residential purchase in the Chatsworth area. The Chatsworth area is renowned for being a private GCB (Good Class Bungalow) enclave in Singapore. The family made the purchase of the same on 6th June 2017. Nearly 15 bungalows have been sold in these areas so far since January. 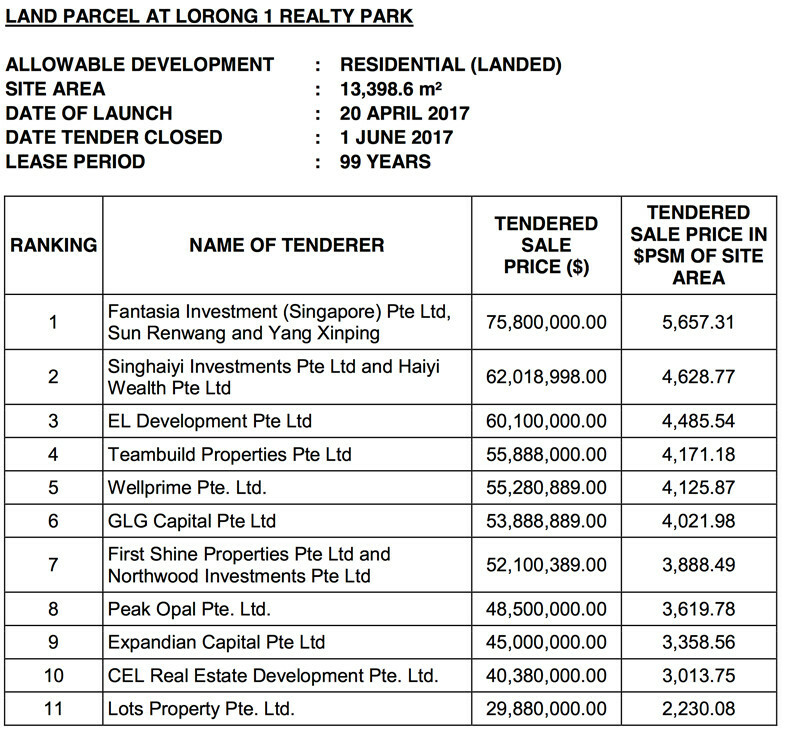 The leading developer of China, Fantasia Holding Group, with subsidiary in the name of Fantasia Investment, Singapore, came out as the top bidder among the total of 11 groups of developers for a low rise private residential site at Lorong 1 Reality Park. Fantasia investment made the highest bid at S$75.8 million which turns out to be S$525.58 psf ppr (per square foot per plot ratio). The least bid came from Lots Property at a price of S$29.88 million. Lots Property was a part of Yuan Ching Development. The (Government Land Sales) GLS tender for this residential plot was closed on 1 June, at noon. It has been expected that TUAS West Extension will improve the connectivity within the Tuas area and people will find it easy to reach their destination through the MRT station. It has been developed to meet the requirements of 100,000 of commuters. Most of the passengers will get a chance to save their time and money because their journey will be about 25 to 30 minutes shortened. The 7.5 km rail segment will take you towards the industrial heart of the Tuas. So it is a blessing for many workings that were unable to afford others means of transportation. In order to expand connectivity two new bus services, 247 and 248 will be launched will link to TUAS West Extension. The construction of TUAS West Extension was started in 2012 and it was expected that the station would be opened for public at the end of 2016. Unfortunately, it was delayed because the latest signaling system required time to be tested. It is the most advanced system that is not available in any other MRT station. Most of the workers had to travel through the bus service and it was mostly crowded. Most of them had to wait for the next bus that wasted their 30 to 45 minutes. Apart from that, there are many lorries on the road that were the cause of traffic jam. However, with the TUAS West Extension, the problem of traffic jam will be resolved. The TUAS West Extension will be perfect for the working women. Now they can quickly pick their children from the daycare and reach their home on time for dinner. It is a nightmare for the private bus service providers because they have to change their route and most of them are going to end their service. Now people will not have to worry about getting a taxi before 5 pm because after that their services are closed for Tuas area. They can easily enjoy the car-free ride. Soon pedestrian walkways will be constructed to enhance the easy access of people to the TUAS West Extension MRT station. In the past time, the demand for a more flexible utilization of industrial land made the authorities in charge with such regulations to think about making some changes. Thus, the Urban Redevelopment Authority or URA, together with JTC will make sure of a new set of guidelines for land use, with the occasion of a multi-tenant building development, managed by JTC. Located on the Woodlands North Coast, this new project may open the door for some welcome changes. Besides the manufacturing operations, this pilot project will provide support in the case of various manufacturing companies that will provide a number of services, which include after-sale support and R&D. The project gives companies the opportunity to keep an eye on their off-shored activities, while keeping the activities with a higher important at the location. Also, the Business 1 component, which is also the zone rating of the pilot project, will acquire a broader range of utilizations, which also uses that are related with the industrial sector, in order to provide essential support in the area. As an example, activities on engineering and industrial design, which normally are not allowed in the case of an industrial development, will be permitted in the Woodlands North Coast. The previously mentioned exceptions are the only ones accepted in this particular area, as the rest that are usually not allowed, like non-industrial and clean-cut commercial activities, will remain this way. To better understand the new changes, do note that various commercial uses of the space, such as property consultancy, accountancy, and insurance companies, and agencies for travel and maid services, will not receive any support in the Business 1 sector. But, in case uses like these are proposed, they will have to fit in the white component of the pilot project. Having in mind that land use in Singapore faces a number of constraints, the Government utilized zoning when it came to land use, to protect industrial activities. But, as time passes by, structures built with business purposes need new regulations that are adapted to the way society evolved. Many manufacturing companies make significant changes in their business model, passing from production-led models to activities that are driven by services. Or they are developing new branches than span over the production chain, such as prototyping, after-sales services, and others. Thus, they provide more than just manufacturing services, striving to remain competitive on an ever-changing market. Because of these aspects, the land policies concerning industrial uses were constantly updated by URA. Back in 1990s, the Business Park zone was added by URA, as a way to help manufacturing businesses that unrolled other types of activities to integrate better. A decade later, URA made even further adjustments, introducing media guidelines and e-business, which continued to be improved until 2014. These two were developed out of the need to serve business activities that were media related or were in the IT domain. Between 2001 and 2003, Business-White and Business Park-White were also introduced, which were meant to entwine industrial activities with commercial ones. Thus, the guidelines existent in present days allow companies to carry on a broader range of functions, which can include production, warehouse, technology uses, like autonomous robots and analytics, and so on. This particular pilot project was triggered by the need to provide changes that will help the industry adapt to the new conditions. The way the market will receive this project and the produced feedback will be closely supervised by the government, which will also unroll studies to see where this project is applicable. Also, the policies for land use will continue to be revised, especially when it comes to industrial areas, in order to maintain their relevance. The revisions will have to take into consideration any existent trends in the manufacturing domain, the requirements coming from industrialist, and the trends that may emerge in other relevant sectors. The links below from Straits Time and URA Website will provide more info on the above if you would like to learn more. The collection of sales made over here in the market is striving to steer ahead along with potential sales of private organisations for a sum of $765 million, estate Eunosville. This could be one of the 2nd highest price being imposed for a property like this. Eunosville, which consists of 330 units, which is being built in the late 1980’s could expand to having around 1,399 units altogether with the new project proposal brought up. Surprisingly the particular site has been given away or else been bought by a Jardine Matheson holding unit, land MCL at a ridiculous price which was not made to be expected at all. This has been one of the 4th most successful sale within this year in spite working on to recover developer’s residential property optimism. The highest achieved sale which stands in second place is Eunosville, which is situated nearby the MRT station of Eunos. After it was sold by Farrer Court for a sum of $1.34billion in the year 2007, stated by Orangetee marketing agents. It Was Indeed the second try of the estates after the unsuccessful result of a bid in 2013. More than 17 percent stands as the premium which the owners had insisted in having for $643 million towards $653 million. Constant rise in market improvements are also seen in sales for primary homes, which makes developers to start creating strategic level acquisitions over land in order to create a position for them self towards a recovery in the current market. Eight potential bidders were attracted towards competitive market bids over the area between Changi road and Sims Avenue. This was for the tender of 376,713 sq. Stated by Mr.Oh to the Straits Times. In a whole with all inclusive of government extra charges being added, the cost accumulates to an amount of $909 per Square feet for a single plot. The state accepts these payables in order to intensify the use of land to a gross amount ratio of 2.8 along with adding up a lease to 99years freshly. As mentioned before that this project was built in the late years of 1980’s, 71 years have been laid on as the lease. Towards six complete residential blocks and also four complete walk by apartment plots which includes 75 units. OrangeTee stated that each and every owner will possess the right of getting about $2.25million to about $2.41million towards completing the deal which is subjected to a particular sales condition. One of the resident named Mr Ben Ong, who has been a loyal resident of Eunosville for the last 17 years is in a very sentimental condition about leaving although he is aware and identifies that the old structure is now in need of renovation. It is indeed a very sad situation said Mr. Ben Ong. As this is the place where they brought up their children and not forgetting to mention that, the location is so convenient for them as well. Therefore for the resident, he may want to purchase an apartment unit here after the new structure is put up in the near future. CBRE consultancy office stated that the newly completed units will be put out for sale for an average sum of $1,700 to almost $1,750 per single square feet.